Test Sonos at Home with free Napster | What Hi-Fi? Just in case you've being thinking of buying into the Sonos multiroom music system but wondering whether it's right for you, the company's now offering a Test Sonos at Home program with any purchase of the Sonos Play:3 speaker/player, giving you all you need to try it at home for two months. 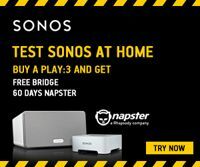 Buy a Play:3 before the end of this month, and you'll get a free Bridge (usually £39) to connect to your router and stream music to Sonos players around your home, and 60 days' subscription to Napster Unlimited plus Mobile when you register your purchase before July 14th. What's more the Play:3 and free Bridge come complete with a 60-day money-back offer, making the Sonos test Pack effectively free to try. For details of participating retailers, or to order the Sonos Test Pack online, go to the Sonos promotional site.